I am using promix JointQ for quite a long time for my own arthritus and now also EM Health Booster and all I can say is that I am a new person. I don’t have anymore joint pain and since I started using the EM my colon is much better. I was diagnosed with Ulcerative Colitus and was suffering a lot of stomach pain and should always be aware off what I ate. I am so much better now and I am only on the second bottle off EM. For my dog I use the shampoo which is the best her fur is so soft and lovely. And then yesterday I saw red spots on her neck and breast and do not know where it came from. I realise that it is an allergy so I put some Fixaway Balm on and this morning most of it was gone. I am using Cortizone and because of that my skin is so thin it tears of my arms when I hit myself to a cubbard corner or even with my own nails and I am always full of purple spots. FixAway balm clear the dark bloodspot in just 2 days from my skin. 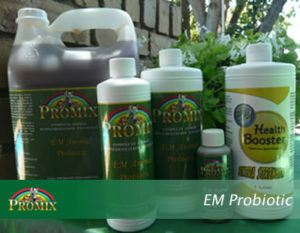 I can’t get enough of Promix products and believe there’s nothing better. So Promix for me!!!!! !